In the beginning of the 18th century, the Six Nations of Iroquois controlled the area from Erie, Pennsylvania to West Virginia and west into the Ohio Valley. The six tribes were dominated by the Seneca and included the Cayuga, Mohawk, Oneida, Onondaga, and Tuscarora. Some European fur traders, then farmers, began to migrate to the area. Most were Scots-Irish and German. It was a brutal life, and during the French and Indian War they bore the brunt of raids against white settlers. After the War, the English government and the tribes signed a series of treaties, resulting in a steady stream of homesteaders coming into the region. According to many sources, John Henry, a 16 year old Scots-Irish immigrant, was the first white settler in the region around 1760. A fur trader and noted Indian fighter, he is thought to have built the cabin which is still standing along Pinkerton Road in North Fayette Township. Eventually he moved south of Pittsburgh to farm, becoming a founding member of the Mt Lebanon United Presbyterian Church and a Commissioner in Upper St Clair. In 1772, the Walker brothers came west to farm and likely knew John Henry well. Gabriel and Isaac Walker migrated from Lancaster County and were the first to record a legal claim to the land. Both served in the Revolutionary War. In the 1790s they participated in the Whiskey Rebellion and the records show they were charged, imprisoned, and taken to Philadelphia to be tried for treason. They were pardoned and returned home. 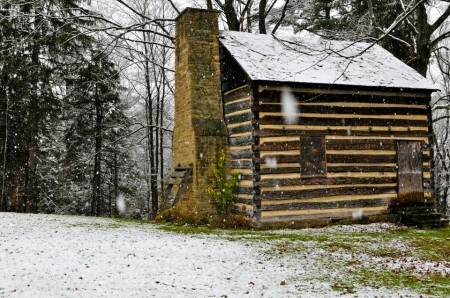 Tradition has it that Gabriel Walker built a log cabin about 1 mile east of the one built by John Henry, also on Pinkerton Road but in what is now Collier Township. That cabin was burned in 1782 during one of the region’s best-documented Indian attacks. A raiding party surprised the family. Two of Walker’s sons, ages 8 and 12, were scalped and killed; three other Walker children were kidnapped, but later found and returned to their family. The cabin was rebuilt and still stands. By 1785 maps show that the land had been surveyed and deeds registered to numerous families. The family names would come to identify many of today’s roads and landmarks. One notable owner was Hugh H. Breckenridge who owned 441 acres of property called Parmassus, which was adjacent and west of the Walker and Ewing tracts. Brackenridge never lived there but was well known in Pittsburgh as a politician and lawyer. He started the first western newspaper, the Pittsburgh Gazette, and obtained state endowments in 1787 for the establishment of the Pittsburgh Academy, which eventually became the University of Pittsburgh. The Brackenridge property was subsequently split up and sold to other families. As of the early 1800s, the Walkers and Ewings were two of the township’s wealthiest families and owned significant land in the area. In 1808 William Walker (Isaac’s son and Gabriel’s nephew), married James Ewings’ daughter, Jane, and in 1816 the couple was given 431 acres of land including both cabins. William Ewing eventually sold the land to his sons: Samuel Walker Ewing and James Nelson Ewing. When James Nelson Ewing died in 1902, his three daughters inherited the property. One of the sisters, Amy Ewing Glass, subsequently purchased her sisters’ shares, which explains the naming of the Walker-Ewing-Glass Log House, which is now registered with the Pittsburgh History & Landmarks Foundation. Eventually, the Walker, Ewing and Glass descendants sold their properties to Allegheny County. The 1850 Census shows that James Nelson Ewing and his 23 year old wife Margaret lived next to Irish settlers Henry and Elizabeth McGill. The McGills had bought a portion of the Breckenridge property in 1835. Two of their sons, William J. and Henry McGill Jr., subsequently owned property at the center of the Botanic Garden site on the hilltop where the permanent Visitors’ Center will be built. They raised field crops and livestock on two adjoining farms. However, the land was tough to farm due to the slope of the land and the shale. While it’s not known which families sold the mineral rights on their properties to Pittsburgh Coal Company, it was a common practice as it brought much-needed cash while protecting their livelihood as farmers. Pittsburgh Coal Company was owned by the Mellon family and merged with the Consolidated Coal Company in 1945 to become the Pittsburgh Consolidated Coal Company, which is now Consol. The area was deep mined in the 1920s and then surface mined in the 1940s. William J McGill’s family farmed this land for three generations. Descendant Beth McGill Ellis grew up on the family farm and recalls that after the mining, the water was not potable due to the acid mine drainage, and they had to drive into the community of Oakdale to fill jugs with drinking water. The McGill farm was sold to the County in 1971.